What did Isaac Newton mean by this following quote of his? Try to explain the quote to me in the simplest terms possible. 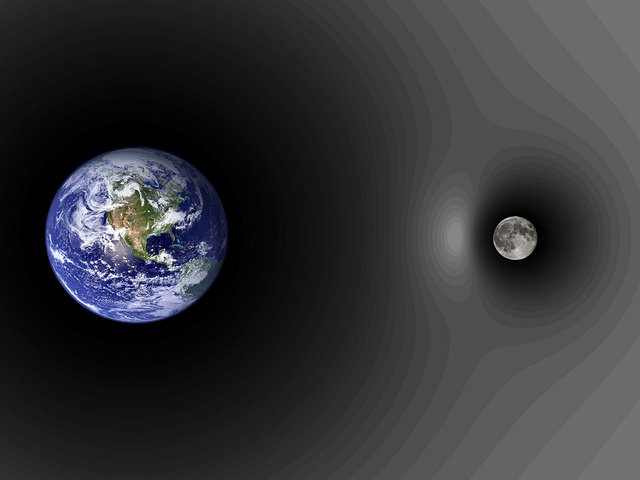 Consider the image below which dipicts a "gravitational field" being produced by a massive object. Other objects in turn respond to the "gravitational field" that is present in their local vicinity. That is, the moon in the image below isn't responding to the Earth directly through a mysterious action at a distance, but rather the moon is responding to the nearby gravitational field produced by the Earth. Newton is stating he belives that gravity must work locally through something like the gravitational field dipicted below, rather than being a true action at a distance. Not the answer you're looking for? Browse other questions tagged newtonian-mechanics forces newtonian-gravity history or ask your own question. How did Newton discover his second law? How did Newton discover his third law of motion? Didn't anybody see an apple falling before Isaac Newton? How did Newton discover the universal law of gravitation? How did Isaac Newton figure out how the law of gravity worked? How did Newton establish his famous third law of motion? How did Newton figure out the law of gravity? Did Newton estimate the gravitational constant $G$? How did Newton know that there is force between two mass?